Seabird bycatch is a global problem (e.g. Anderson et al 2011). Humans like eating fish and seabirds do too. 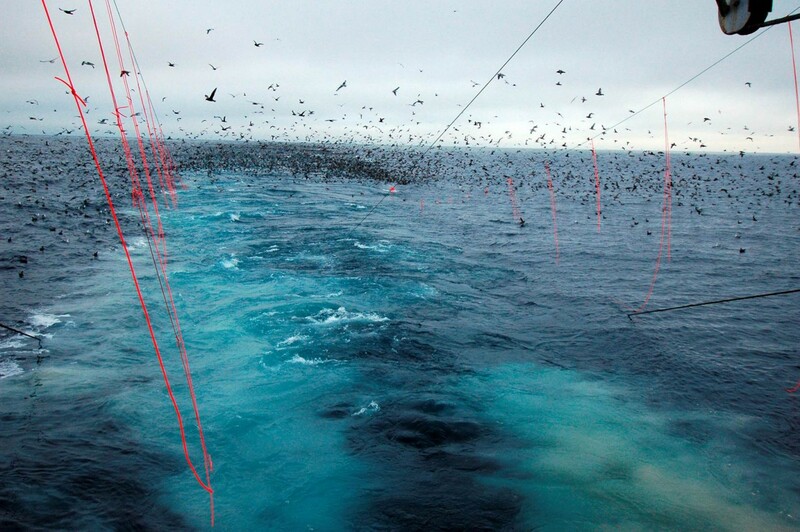 Fishing vessels provide a food source for seabirds through discards, bait, and target fish. Different types of fishing gear pose different risks for seabirds. The good news is there are things that we can do to decrease these risks. Albatrosses and petrels are particularly vulnerable to being hooked by longlines as the baited hooks are set overboard. 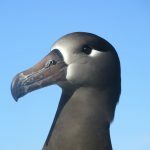 Albatrosses and petrels are long lived (e.g., Wisdom the 65-year-old Laysan Albatross) and have a limited number of off-spring. Therefore fishery mortalities can have devastating impacts on populations if left unchecked. Currently all 22 species of albatrosses have IUCN statuses ranging from Near Threatened to Critically Endangered. 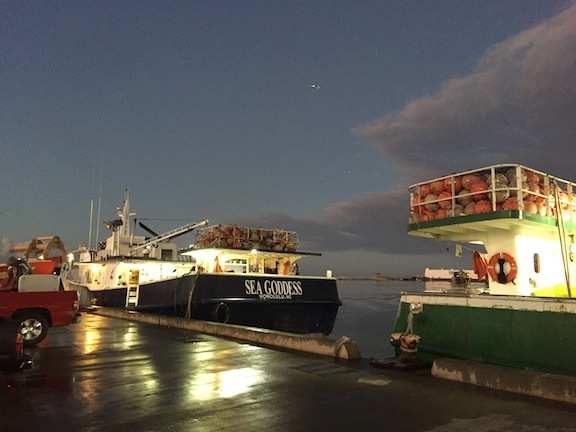 Longlines are used to catch a number of target species including tuna, swordfish, halibut, black cod, and toothfish. Just like the diversity of species this type of fishing gear is used to catch, there are a number of ways to set long-lines and ways to mitigate seabird bycatch and a method that works well in one instance may not work so well in other places. Tori Lines (a.k.a. streamer lines), side setting, night setting, faster sinking lines, and discard regulations are a few of the methods used. In early November, I had the opportunity to attend a workshop in Honolulu, Hawaii hosted by the Western Pacific Regional Fishery Management Council. 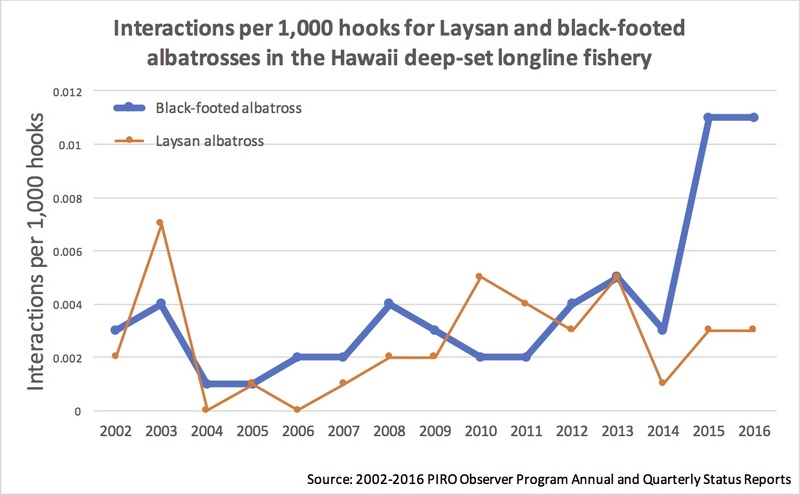 The workshop was held due to a dramatic increase in black-footed albatross bycatch by the Hawaii deep-set longline fishery in 2015 and 2016 (see the figure below). It was our job to figure out why, or more realistically pave the path for future analysis and data collection to answer this question. Recently Leigh Torres and I were funded by the NOAA Bycatch Reduction Engineering Program to characterize fine-scale fishery-albatross interactions using previously collected albatross tracking data and tracks of fishing boats processed in real time by Global Fishing Watch. The workshop provided the perfect opportunity for me to learn more about the Hawaii longline fisheries. Rates of bycatch can change due to many factors, including where or when the fish are being caught, subtle choices made by fishermen, changes in seabird distributions, changes in prey of fish or seabirds, and so on. So, it can be very challenging to pin-point the exact reasons for an increase in bycatch. But, across the North Pacific, 2015 and 2016, were very strange years oceanographically. There was the warm water phenomena known as ‘the Blob’ along with a strong El Niño, and a positive Pacific Decadal Oscillation (PDO). So perhaps, bycatch levels will drop off again as we move into a La Niña, but perhaps not. It is good to know that fishery managers and scientists are paying attention. 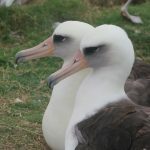 From the perspective of the fisherman in the Hawaiian longline fleet, albatrosses are hardly ever caught; they are pulled in at a barely perceptible level of less than one bird per set and only from about December to July. 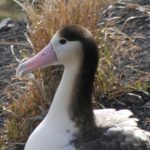 Although one occasional dead bird among the menagerie of fish doesn’t seem like much, it can add up: there are ~140 boats in the deep-set longline fleet, that set 40-52 million hooks a year, plus the multiple other fisheries and fleets encountered by albatrosses across the North Pacific, and enough albatrosses could be killed to make a difference in their population numbers. And, we need to also consider the cumulative impacts since fisheries aren’t the only threat (e.g., sea level rise, storm surges, introduced predators; see Bakker et al 2018). On the morning of the last day of the workshop we took a field trip to the Honolulu Fish Market at Pier 38 in Honolulu where the Hawaiian long-line fishing vessels dock to offload and sell their catch. We checked out some of the boats, watched fish being craned off a vessel into a large cart and went inside the cooler room to see where the fish are auctioned. In the cooler room, the catch from one vessel was laid out on brilliant blue pallets. The tails of each tuna were sliced so the deep pink color of the meat could be assessed. A core sample of each fish was laid out on an identification tag. Then the auctioneer and the buyers visited each fish, rapidly bidding on a price per pound. Their quick words were basically incomprehensible to my untrained ear. The prize-catch of the fishery, and the fish that gets the highest price per pound, is the big eye tuna. A number of other large and beautiful pelagic species are also caught and sold including: long and narrow marlins, with their bills cut off for packing, side table size pomfrets, speckled white with red accents; and the distinctive blunt headed mahimahi, with yellow bellies. Once the fish are sold, they are moved out of the auction room, packed and loaded into the trucks that whisk them away toward markets and restaurants in Hawaii, the U.S. Mainland, and beyond. Sustainable management of these commercially valuable fish is dependent on a better understanding of their pelagic ecosystem, including when, where, and why albatrosses interact with fishing vessels. Hopefully, our current research project will help to answer some of these questions. Previous Previous post: A Marine Mammal Odyssey, Eh!